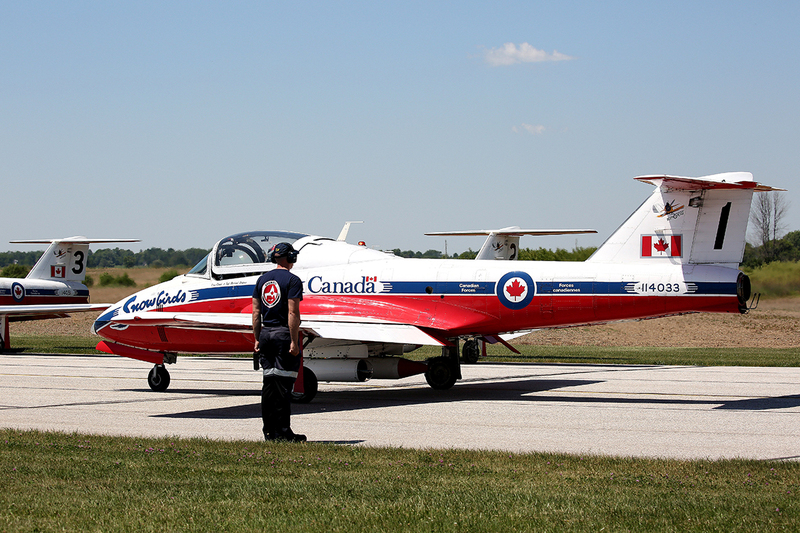 After viewing many of the graceful and intricate aerobatic performances of the RCAF Snowbirds over the years, I can appreciate why the Snowbirds aerobatic team, with its highly skilled and professional pilots and technicians, is an undeniable symbol for Canadian national pride. 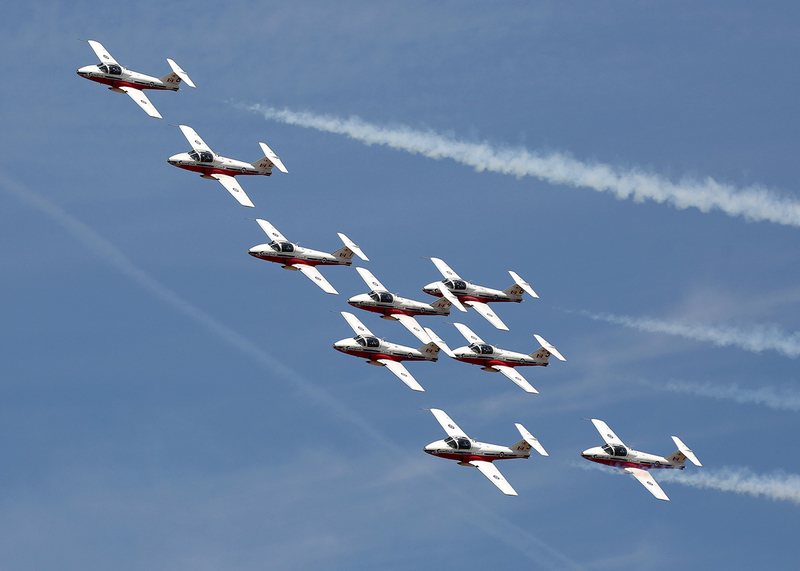 And, again, during the 2016 air show season, with their finely-honed aerial performances, the Snowbirds will be proudly flying the Canadian flag all across North America from coast-to-coast in both Canada and the USA. 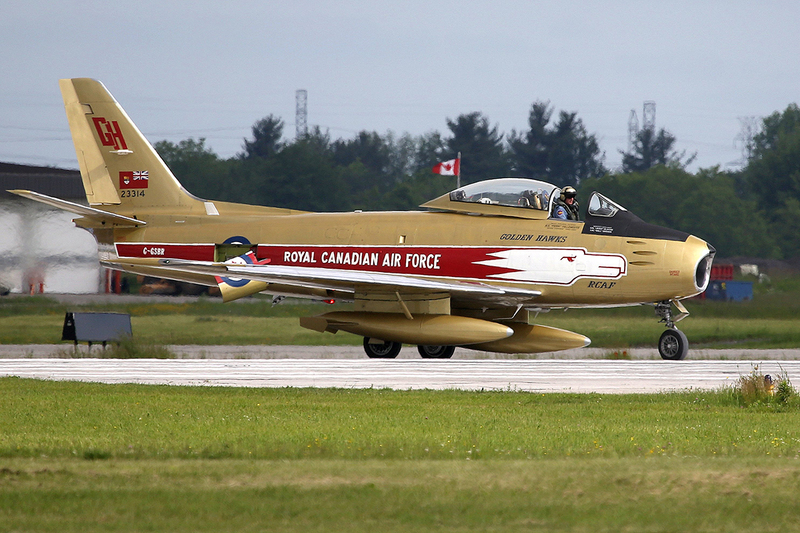 Canada has always has a proud history of military aerobatic demonstration teams starting in 1929 with the Siskins Team flying Siskin IIA biplanes and in 1953 with the Golden Hawks and their seven gold-painted F-86 Sabre jets. 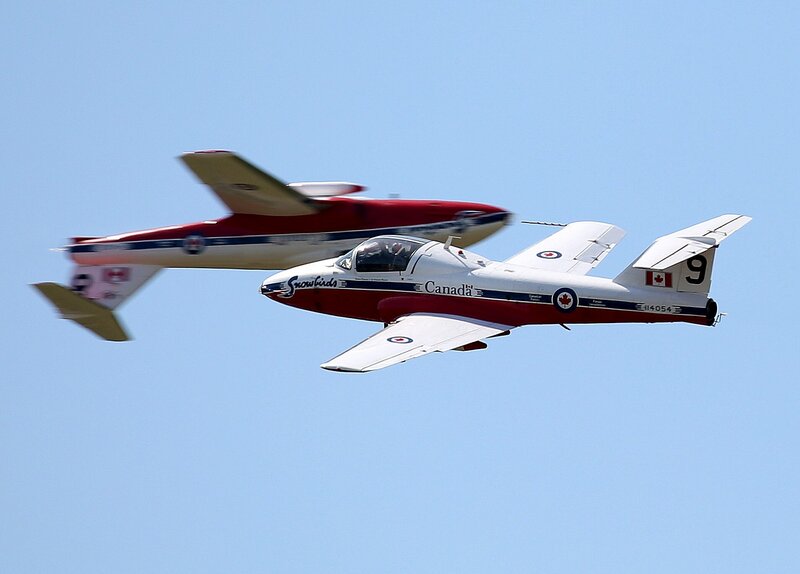 The seed for the Snowbirds was firmly planted in 1967, Canada’s centennial year, when ten CT-114 Tutors received the gold and blue paint scheme. 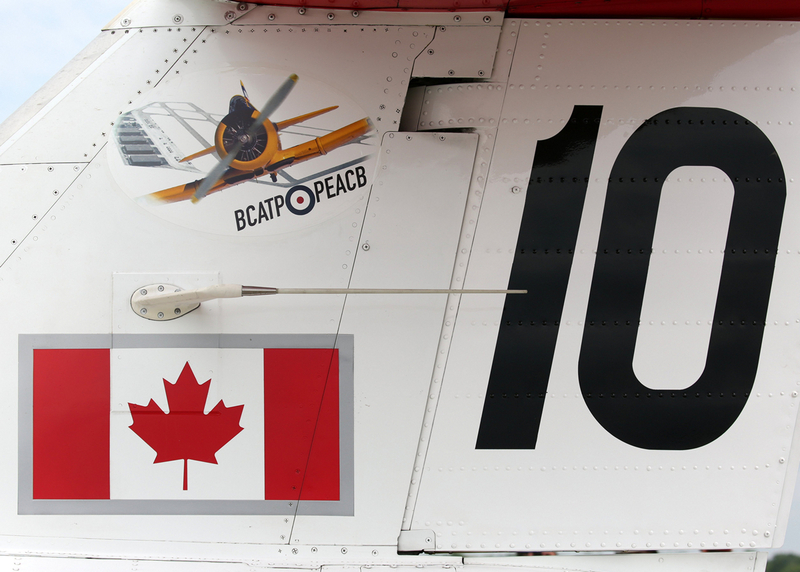 They then performed all across Canada as the RCAF Golden Centennaires during that year. 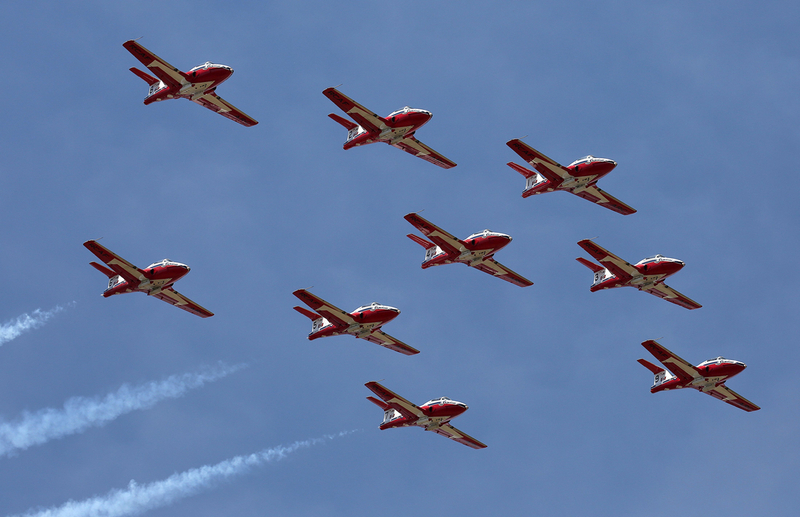 At the end of the 1967 celebrations they were disbanded, but had made such a positive impact that they later gave rise to the Snowbirds in 1971. 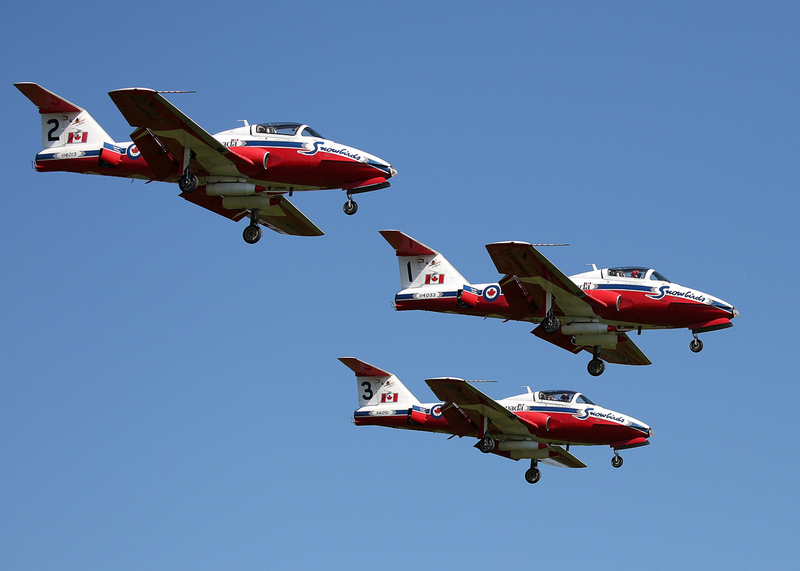 The Snowbirds, officially designated as the 431 Air Demonstration Squadron of the RCAF, are based in CFB Moose Jaw, Saskatchewan and fly the Canadair CT-114 Tutor, a Canadian-built jet that was the primary pilot-training aircraft from 1963 until 2000. 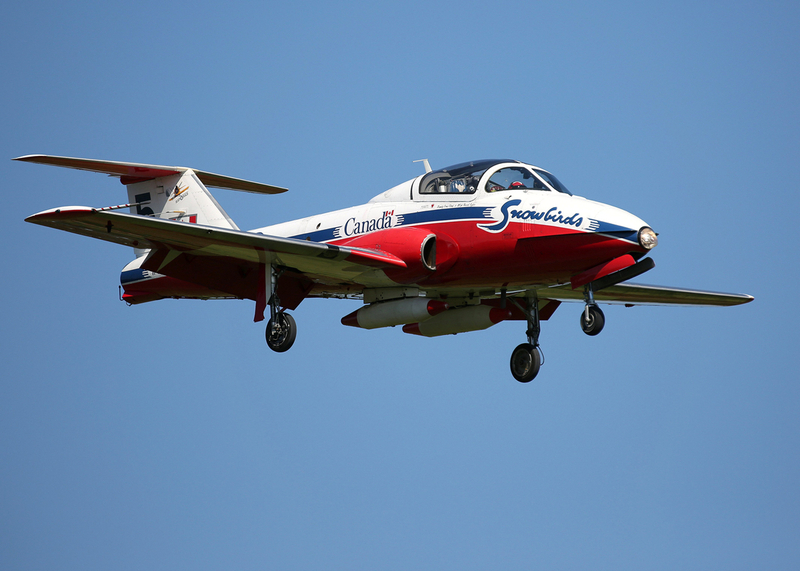 The Snowbirds fly the Canadiar CT-114 Tutor, a low wing, subsonic, single turbojet engined aircraft. 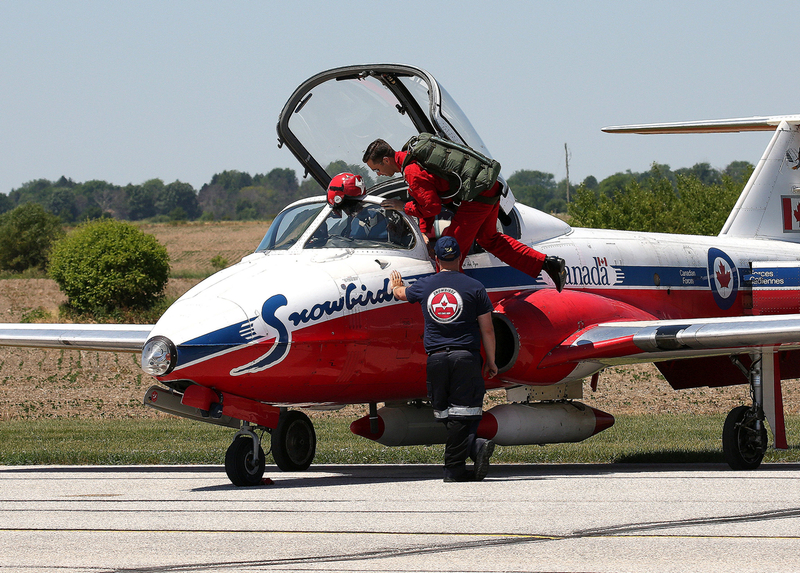 The Canadair C-114 Tutor's side-by-side seating make it an ideal platform for traing new Snowbird pilots. 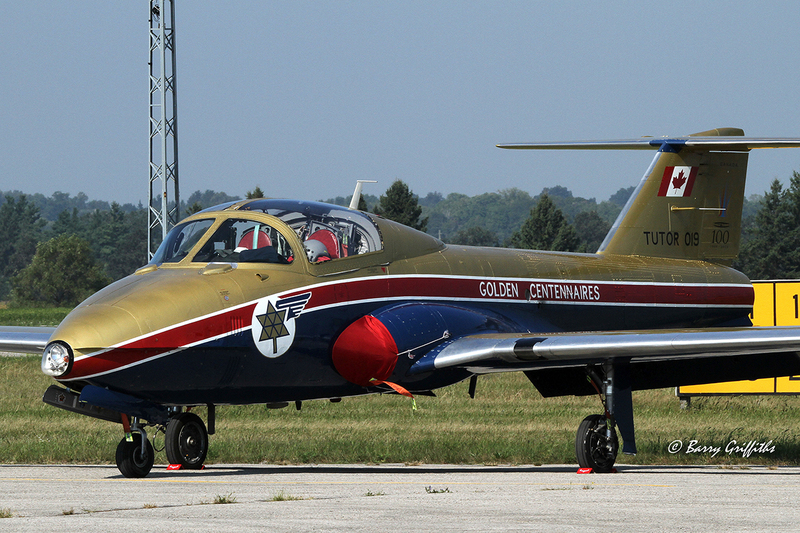 This solidly-built jet trainer was built to withstand student pilot overstressing and mishandling and was therefore ideally suited to train Canada’s military pilots. 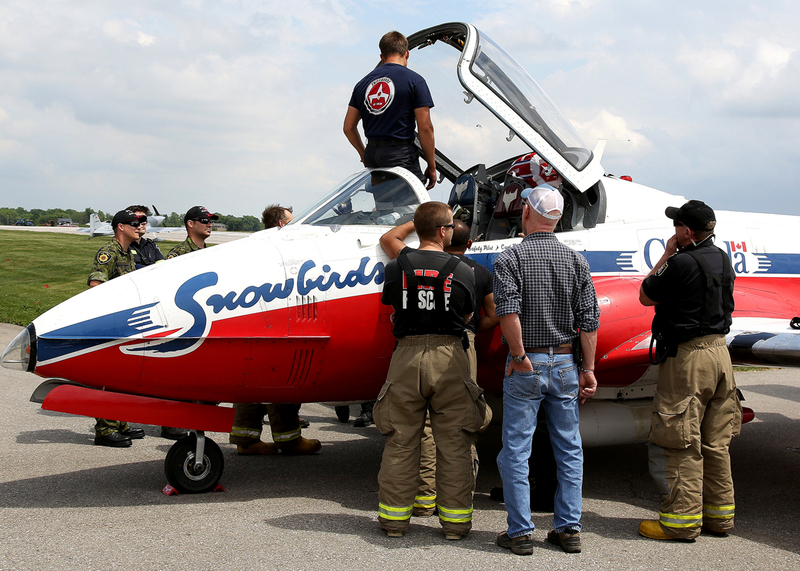 It is the only aircraft the Snowbirds have flown and, with its side-by-side seating, it makes an excellent training platform for new Snowbirds. 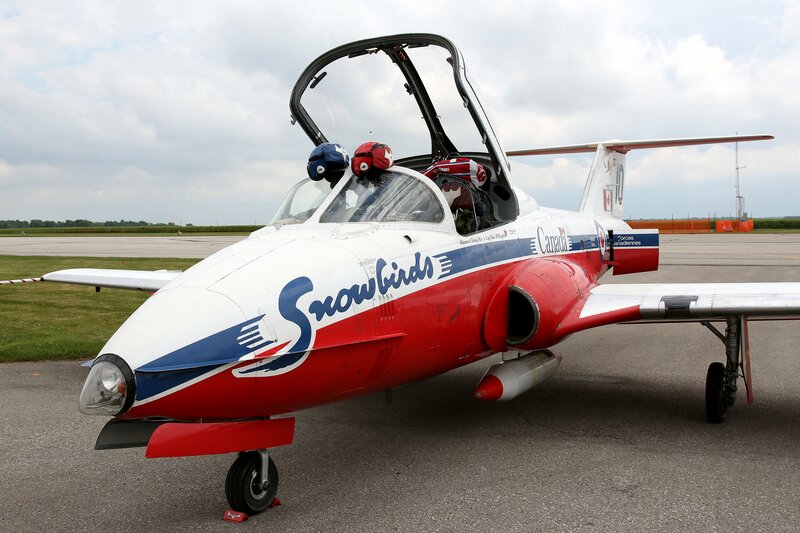 The advantage being that, during training sorties, the Snowbird instructor can observe and evaluate the control inputs of the fledgling Snowbird and assist in making any adjustments. Capt. 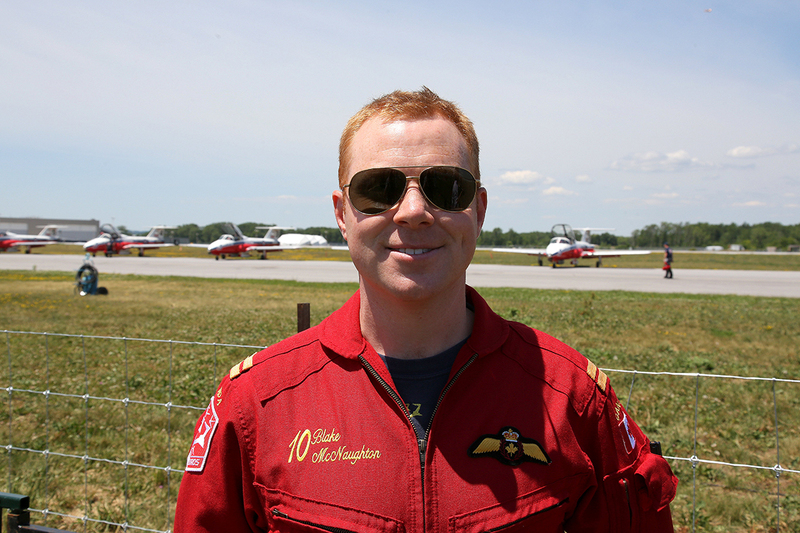 Blake McNaughton was a Flying Instructor on the CT-156 Harvard and the CT-155 Hawk before joining the Snowbirds in 2015. 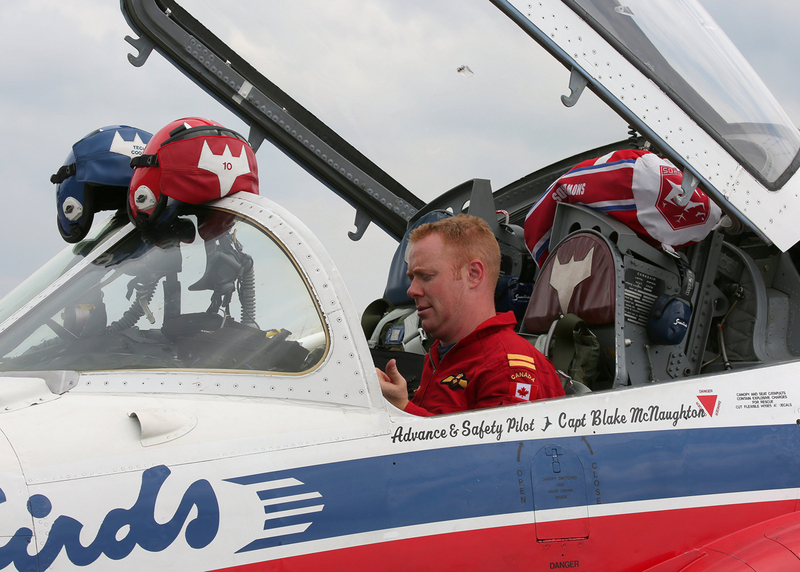 Capt Blake McNaughton was a Flying Instructor on the CT-156 Harvard and the CT-155 Hawk before joining the Snowbirds in 2015 as the Advance and Safety Officer. 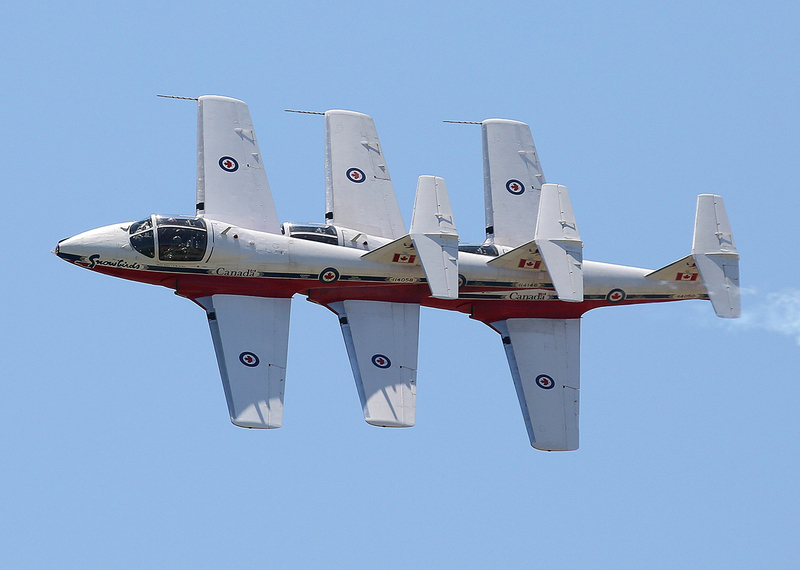 The straight wings of the C-114 Tutors allw the formation to make very tight turns within the air show box. 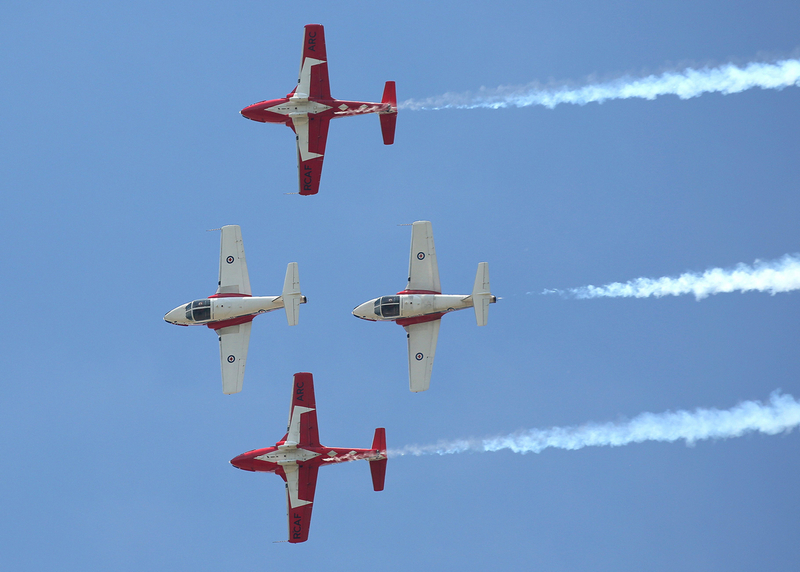 The straight wings of the Canadair CT-114 Tutors allow the Snowbirds to turn sharply and keep a tight formation. 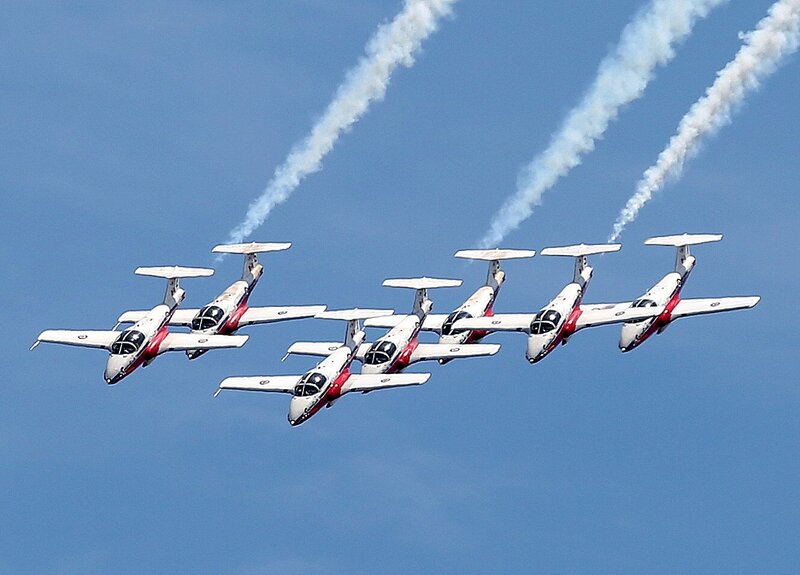 The hallmark of any Snowbirds’ show performances is the tight formations that ebb and flow through the sky in a graceful ballet of meticulously controlled flight. Capt. McNaughton attributed this special style to some of the Tutor’s unique attributes, “The Tutor has a straight wing with a jet, which is fairly rare, so it has a very nice turning radius which allows us to keep the show very tight in front of the crowd. This means that our on-stage time in front of the audience is greater and, with nine airplanes, we always have something going on in front of the crowd. Whereas a different jet with more thrust and a delta wing has to have a much wider show. We are very proud of that fact. 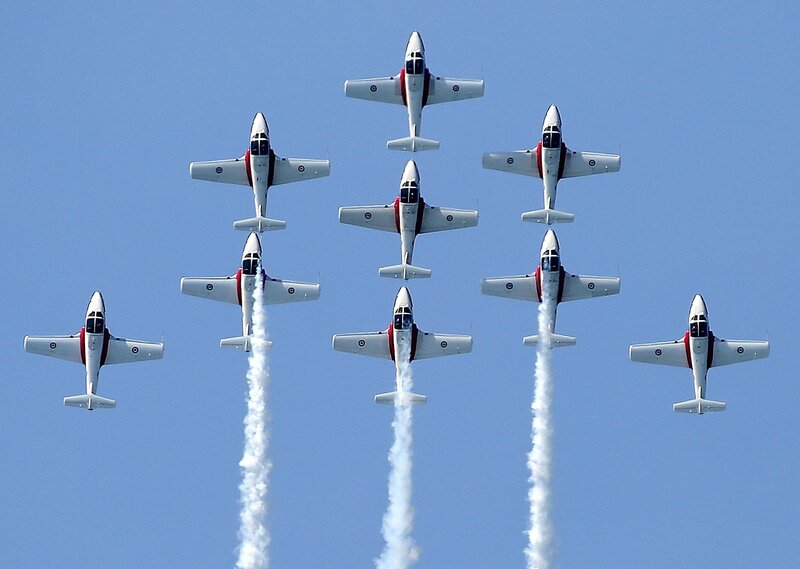 The “Boss” is the team leader and flies Snowbird 1. 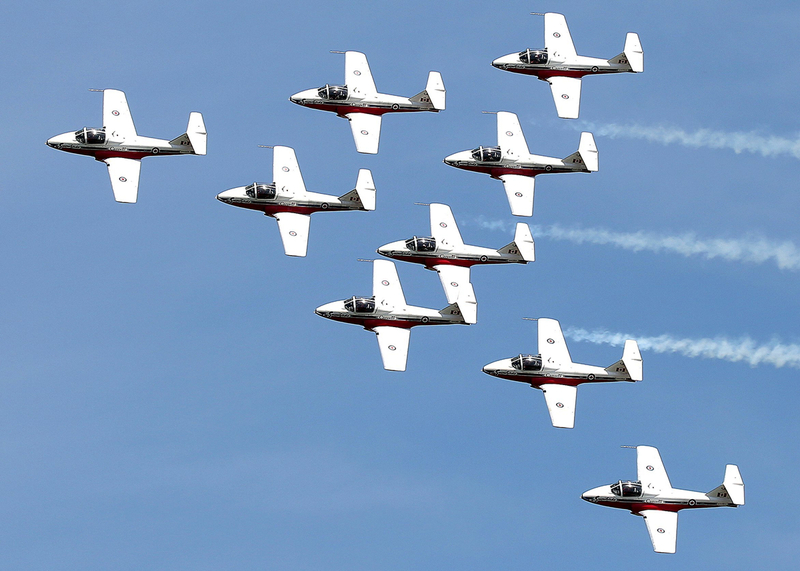 The Snowbirds flight team is an elite aerobatic unit with a total of 11 aircraft flown by nine show pilots and two advance and safety pilots. 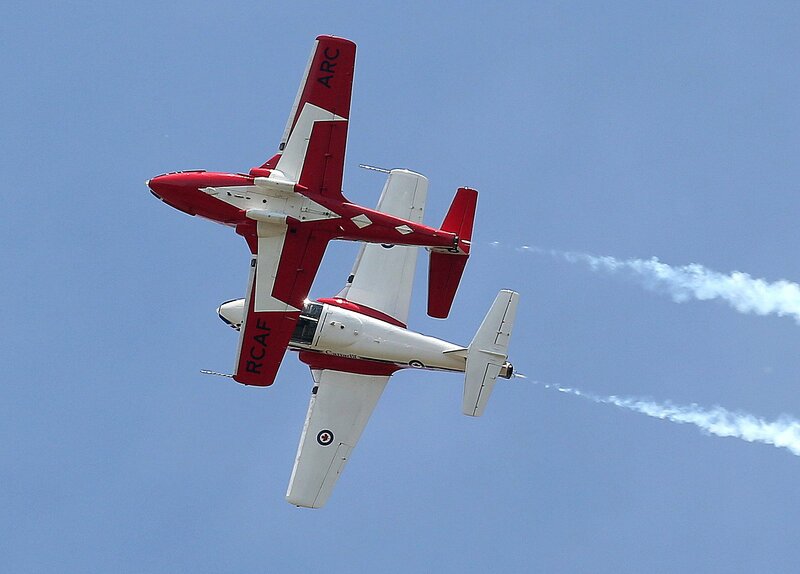 The commanding officer/team leader Major Yanick “Crank” Gregoire flew Snowbird 4 for the 2010 and 2011 show seasons and was appointed to his current position in August 2015. He is known as the “Boss” and always flies Snowbird 1. Since it is critical to the team that a uniform level of proficiency is constantly maintained only half of the team is replaced each year. 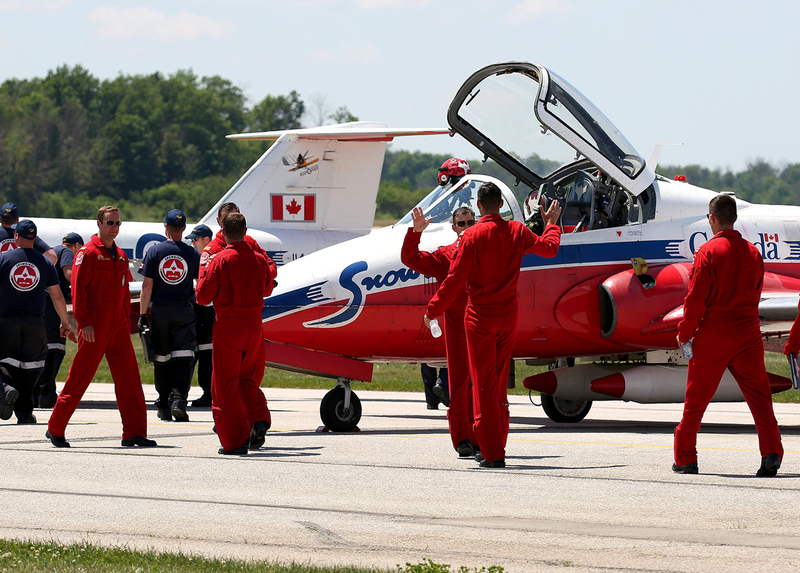 At the start of the selection exercise, the Snowbirds select two qualified candidates for each vacant slot and have them fly with all of the team members. During the intensive assessment period there are up to nine flying days with two or three sorties each day. On the last day the four winners, who have earned the privilege of representing the RCAF and Canada’s Armed Forces for a two-year tour of duty, are announced. 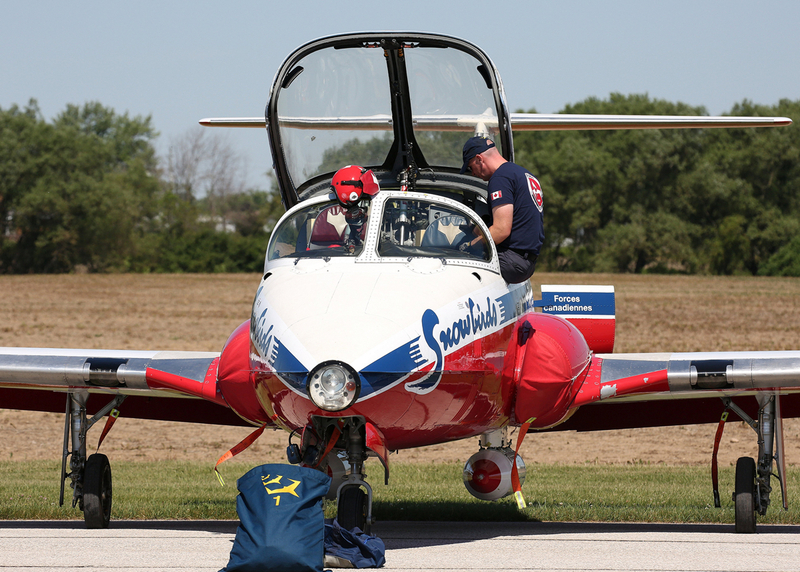 It’s interesting to compare the make-up of North American military pilots and their flying experience prior to joining an aerobatic team. 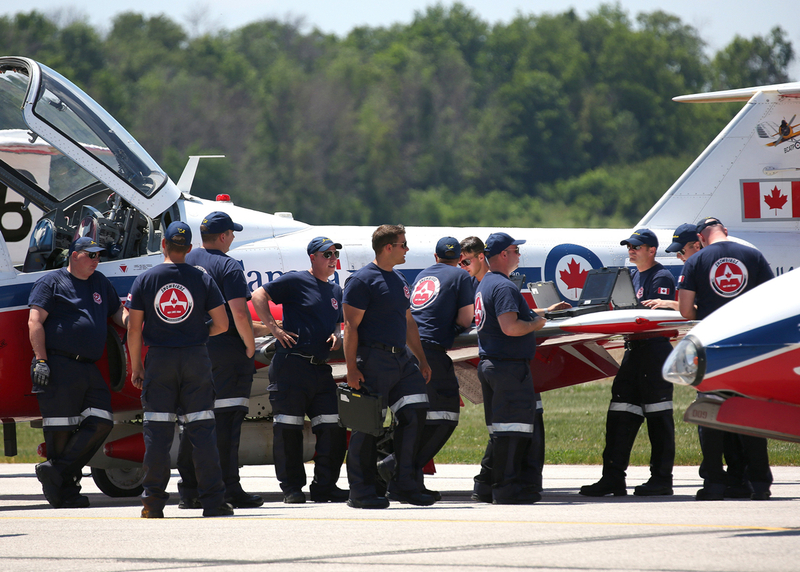 Whereas the fast-jet USN Blue Angels and USAF Thunderbirds only employ fighter pilots for their teams, two Sea King helicopter pilots, one Hercules heavy transport pilot and five Hornet fighter pilots are currently flying for the 2016 RCAF Snowbirds. 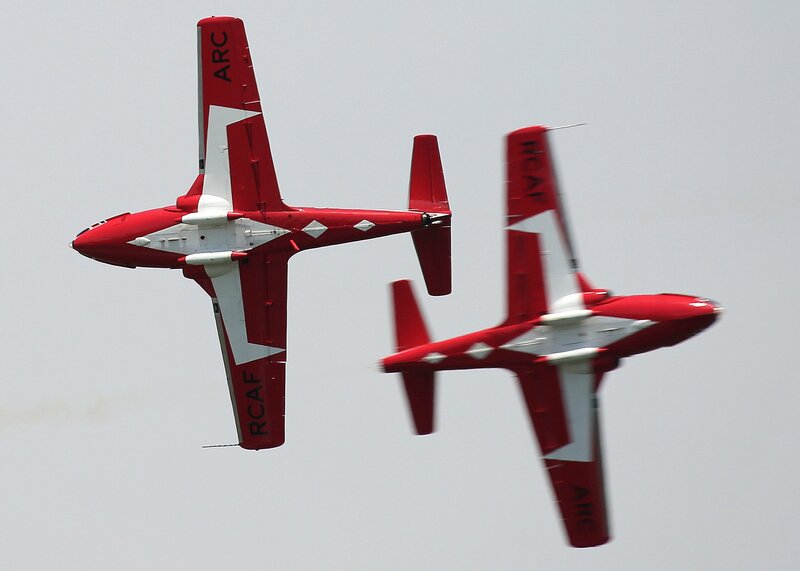 This wealth of multi-role, flying experiences contributes to the overall effectiveness and cohesion of this storied aerial display team. 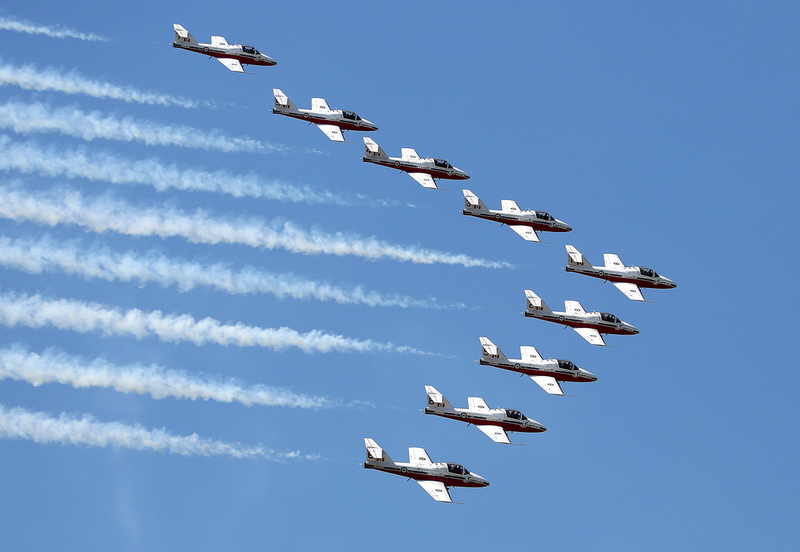 During this training period, the Snowbirds will have designed three shows and perfected each formations they will use in them. There is the unrestricted high show, a modified high show where loops are not permitted because of clouds, and a low show where cloud conditions prevent them from performing higher manoeuvers. 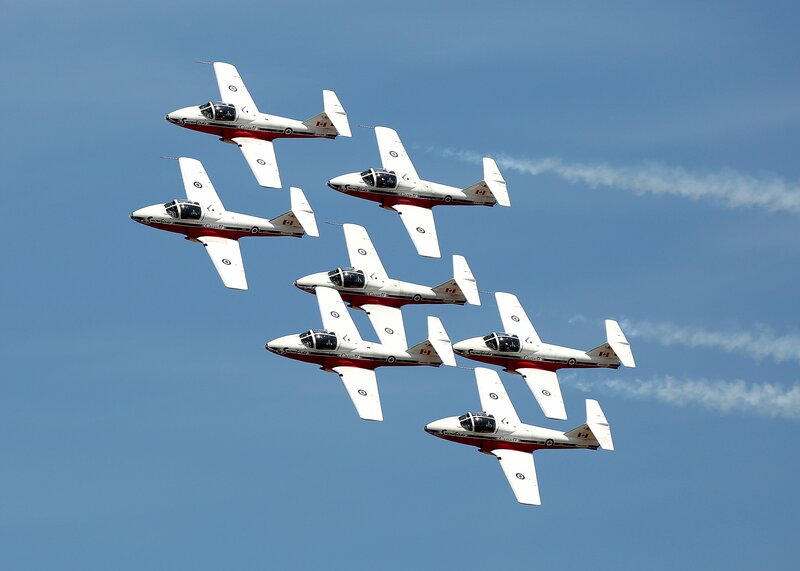 At the start of the air show season in May, the Snowbirds will have participated in upwards of 120 practice sorties and will be on the road for a six month, whirlwind routine of practices, personal appearances and shows. 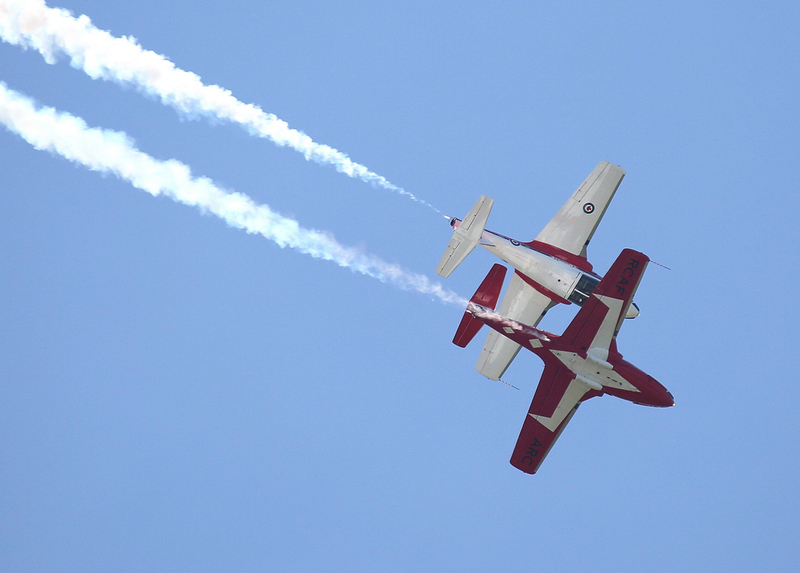 The thirty plus minutes’ performance that captivates audiences wherever the Snowbirds go is unique and differs dramatically from their US military aviator counterparts who fill their show with blinding high speed subsonic passes and full afterburner-inspired pull-ups and vertical climbs. 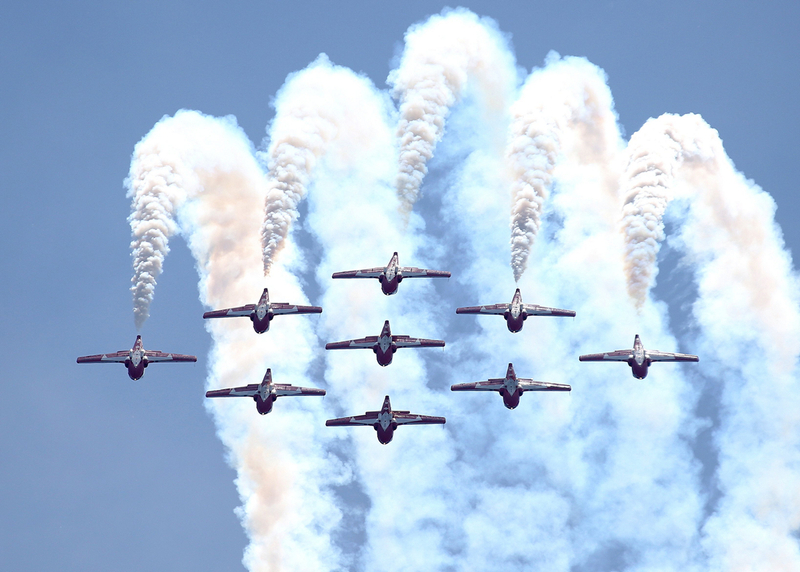 Many of the Snowbirds’ crowd-pleasing manoeuvers are choreographed aerial ballets that involve a complex series of seven and nine-ship aerobatic formations and splits, interspaced with high speed passes by the two opposing solo pilots. 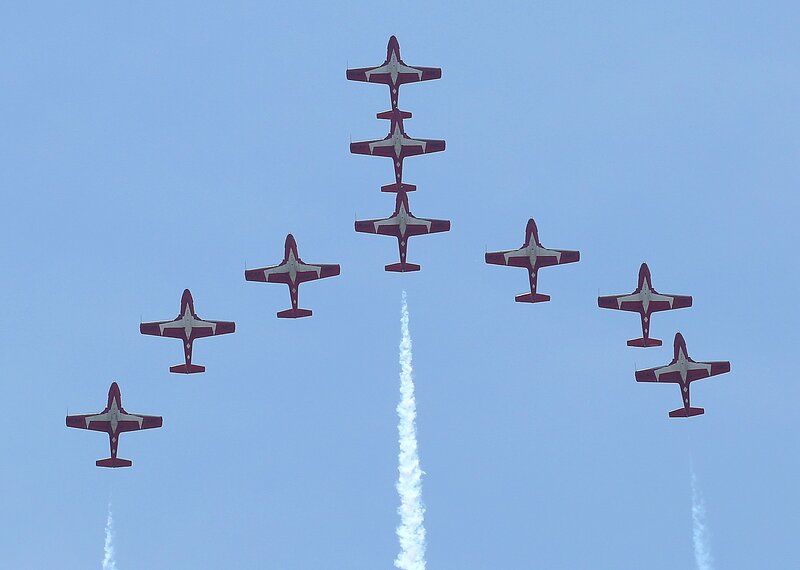 The seven-ship Double Diamond is a signature formation of the Snowbirds. 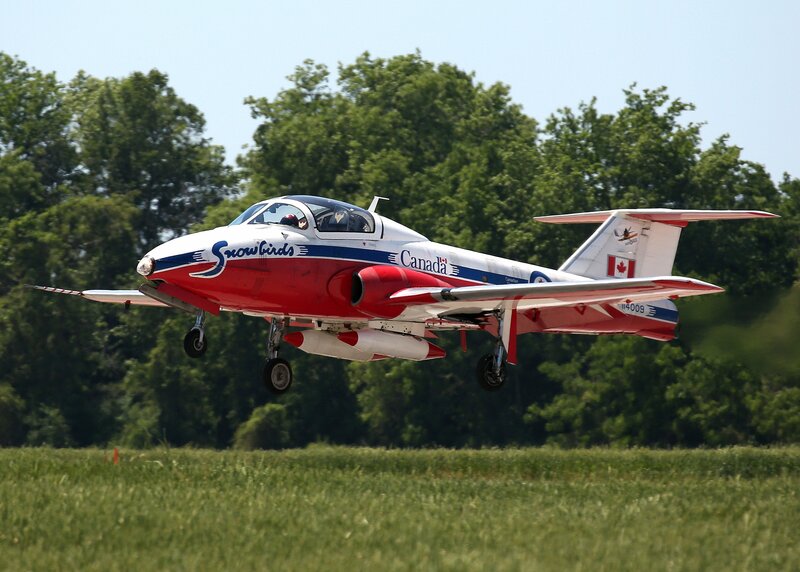 During this 2016 North American air show season the RCAF Snowbirds will commemorate the 75th Anniversary of the British Commonwealth Air Training Plan (BCATP). This was the joint air crew training program launched by Canada during the Second World War, and described by President Roosevelt as “The Aerodrome of Democracy”. By the end of the war there were 151 training schools across Canada and the program had graduated 131,533 pilots, observers, flight engineers, and other aircrew for the Canadian, Australian, British, and New Zealand air forces. 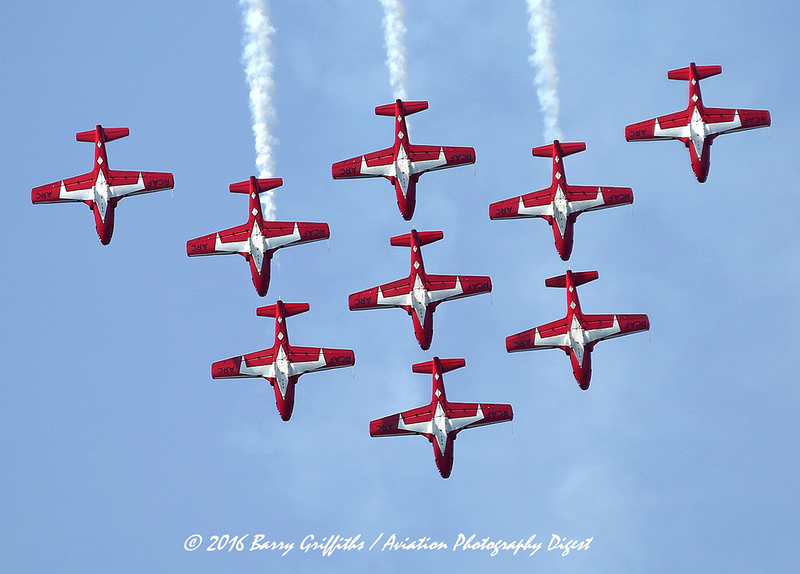 During 2016 the members of the Snowbirds team will be showcasing their aerial magic to huge audiences across Canada and the United States. 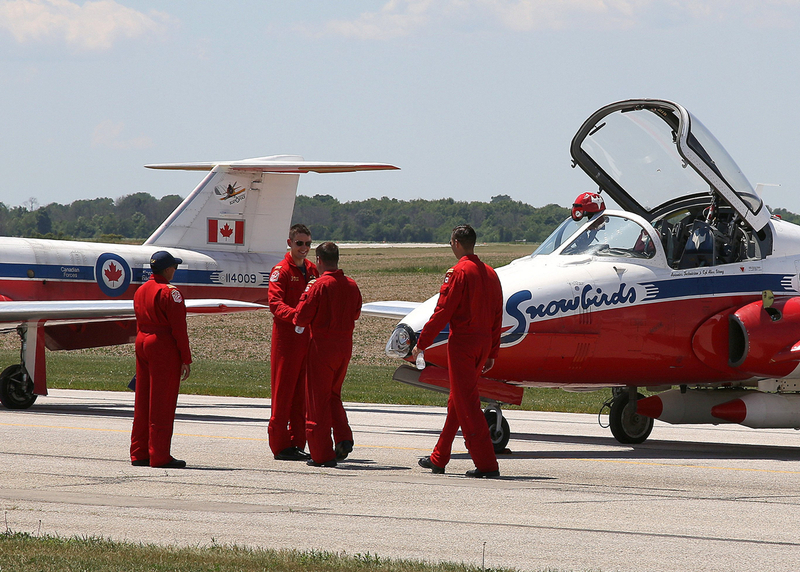 The Snowbirds are genuine Canadian ambassadors for, having created their own legacy within Canada’s aviation heritage, they truly represent the skill, professionalism, and teamwork inherent in the men and women of the Royal Canadian Air Force (RCAF) and the Canadian Armed Forces. 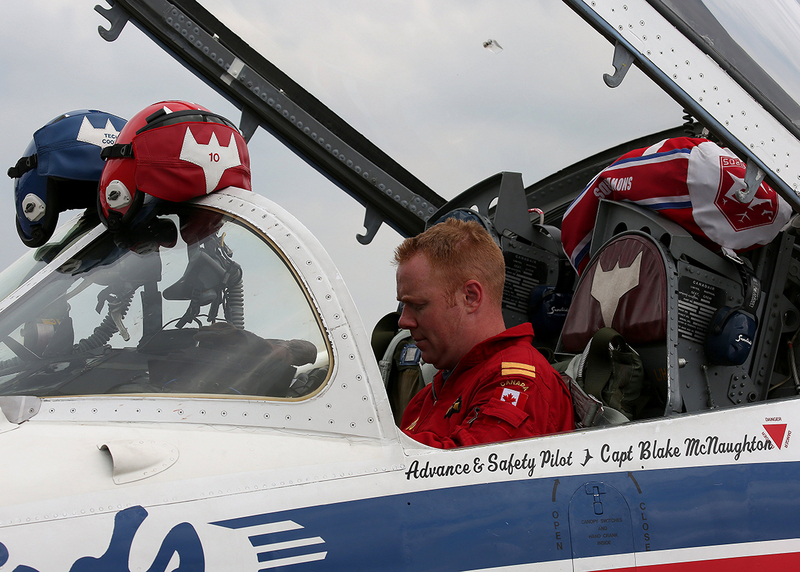 Many thanks to RCAF Snowbird Capt. Blake McNaughton and the Public Affairs Office at CFB Trenton, particularly 2 Lt. Jennifer Howell, Lt. Karyn Blanchette, Capt. Julie Brunet and Capt. 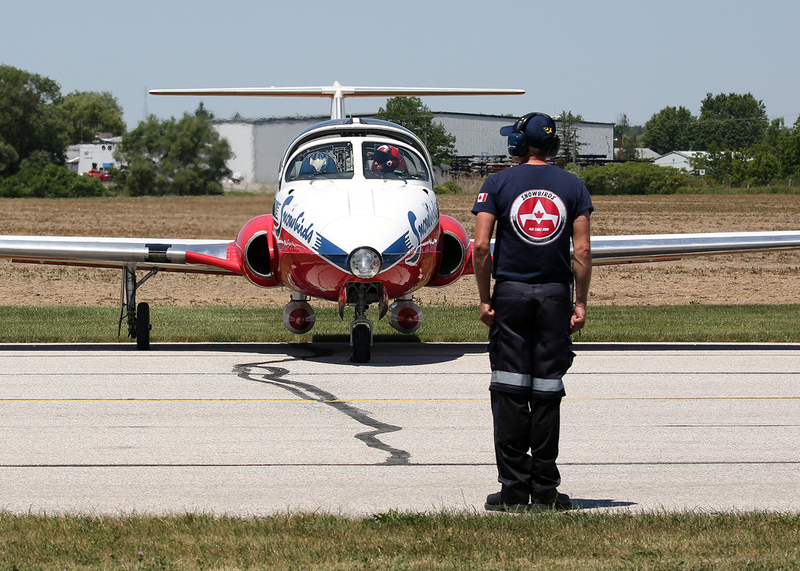 Andrea McKinley, for their assistance during the Quinte International Air Show.